.....and early 911's & 912's! This is what your early Blaupunkt Radio looks like inside! The purpose of this website is to assemble as much information as possible about Blaupunkt radios for 356, early 911 and 912 Porsches. Blaupunkt radios are considered by many to be the premier radio of the 1950's, 60's, and early 70's and most Porsche enthusiasts of this period consider the Blaupunkt, the radio of choice. Information will be presented here about which Blaupunkt radios were offered by Porsche as factory accessories during the 356 and early 911/912 era. Additional information will be presented on how to determine the age and year of manufacture of your Blaupunkt radio. You can help. If you have any information about the Blaupunkt radios you see covered in this website, please contact me. I would be happy to add it to this website with proper credits to contributors! 1. Blaupunkt Radios that were Factory Accessories for 356 Porsches. 2. Radio Wave "Bands" AM, FM, M, SW, etc. 3. Blaupunkt Radio Serial numbers by Year. 4. Euro v. US Version Blaupunkt Radios. 5. Tube v. Tube & Transistor v. All Transistor. 6. Voltage and Polarity Conversion. 7. The "Green Dial-Face" Controversy. 8. The First Transistorized Blaupunkt Autoradio. 9. Radio Descriptions by Year and Model with Serial Numbers. 10. Correct Knobs of Blaupunkt Radios in 356 Porsches. 11. Two, Three & Five Pushbuttons Blaupunkts. 12. Two Piece Case v. 1 Piece Case. 13. US v. Euro Radio Tube Conversion Chart. 14. Face Plates, which one? 16. A Factory 356-B/C Installation Kit. 17. So what about the wires? 18. Blaupunkt Short Wave Adaptor. 19. Odds and Ends of Information. 20. Blaupunkt Service and Instruction Manuals. 21. Blaupunkt Radio Technical Manuals Avaliable. Blaupunkt Radio Identification Website! ID your unknown Blaupunkt Radio! the time period 1953 to 1955.
for 356 and early 911 & 912 Porsches. New information has been added to this Section. The information comes from 356, 911 and 912 Porsche factory accessory booklets and pricelists. These radios are the ones Porsche said it would offer as factory accessories, whether they ended up in your car or not is another matter. Blaupunkt offered many other models of auto radios, only the ones specifically offered by Porsche as factory accessories are listed below. Dealers installed many other brands and models, including Becker radios, Bendix Sapphires, and others. 1. 356-A Factory Accessory Brochure - 1956. Blaupunkt Bremen, AM/Long Wave ($89.50*). Blaupunkt Stuttgart, AM/SW/Long Wave ($109.00*). Blaupunkt Frankfurt, AM/FM/Long Wave ($126.00*). Blaupunkt Koln. AM/FM/Long Wave Automatic ($165.50*). 2. 356-A Factory Accessory Brochure - February 1959. 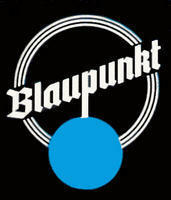 Blaupunkt Bremen, AM/Long Wave (transistor). Blaupunkt Stuttgart, AM/SW/Long Wave/ (transistor). Blaupunkt Frankfurt, AM/FM/Long Wave push button. Blaupunkt Koln, AM/FM/Long Wave Automatic (transistor). 3. 356-B T-5 Factory Accessory Brochure - February 1960. Blaupunkt Stuttgart, AM/SW/Long Wave push button (transistor). Blaupunkt Frankfurt, AM/FM/Long wave push button (transistor). Blaupunkt Frankfurt US, AM/FM/Long Wave push button (transistor). 4. 356-B T-6 Factory Accessory Brochure - September 1961. Blaupunkt Bremen ATR, M-L (all-transistor). Blaupunkt Stuttgart ATR, AM/SW/Long Wave (all-transistor). Blaupunkt Frankfurt ATR de Luxe, UKW (all-transistor). Blaupunkt Frankfurt ATR de Luxe, AM/FM/Long Wave (all-transistor). 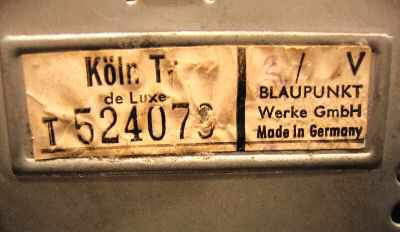 Blaupunkt Koln ATR de Luxe, UKW Automatic (all-transistor). Blaupunkt Koln ATR de Luxe, AM/FM/Long Wave Automatic (all-transistor). 5. 356-B T-6 Factory Accessory Brochure - November 1962. Blaupunkt Berlin ATR, AM/Long Wave (all-transistor). Blaupunkt Stuttgart TR, AM/SW/Long Wave (transistor). Blaupunkt Frankfurt TR de Luxe, AM/FM/Long Wave (transistor). Blaupunkt Frankfurt TR de Luxe US, AM/FM/Long Wave (transistor). Blaupunkt Koln TR de Luxe, AM/FM/Long Wave Automatic (transistor). Blaupunkt Koln TR de Luxe US, AM/FM/Long Wave Automatic (transistor). 6. 356-C Factory Accessory Brochure - August 1963. 7. 356-C Factory Accessory Brochure - September 1964. Blaupunkt Bremen ATR, M-L (all-transistor) ($92.50*). Blaupunkt Stuttgart ATR, AM/SW/Long Wave (all-transistor) ($113.75*). Blaupunkt Frankfurt ATR de Luxe, UKW (all-transistor) ($141.25*). Blaupunkt Frankfurt ATR de Luxe, AM/FM/Long Wave (all-transistor) ($141.25*). 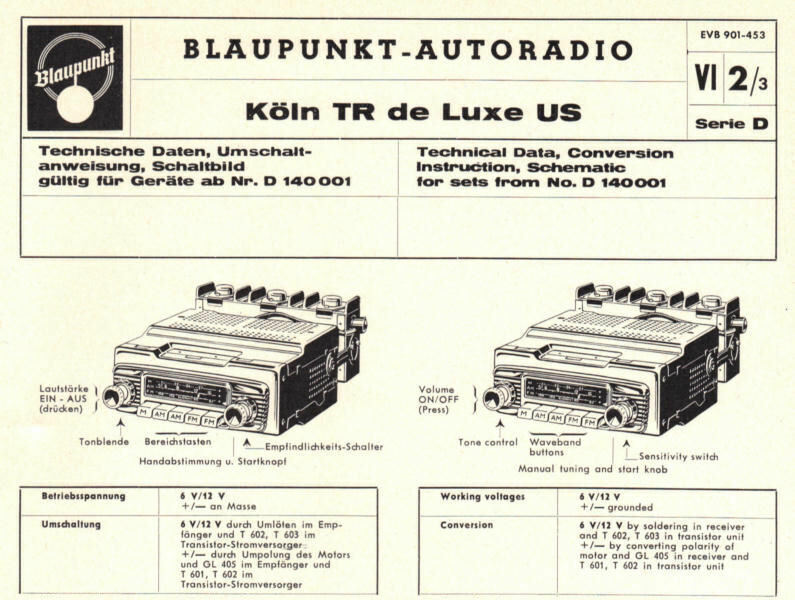 Blaupunkt Koln ATR de Luxe, UKW Automatic (all-transistor) ($185.00*). Blaupunkt Koln ATR de Luxe, AM/FM/Long Wave Automatic (all-transistor) ($185.00*). 8. 911 Factory accessory Brochure - October 1965. 9322 Frankfurt, AM/FM/SW/LW (Euro band). 9322 Frankfurt, AM/FM/SW/LW (US band). 9325 Koln, AM FM/LW Automatic (Euro band). 9325 Koln, AM/FM/LW Automatic (US band). 9. 911, 912 Factory accessory Brochure - November 1966. 9323 Frankfurt US, AM/FM/SW (US band). 9326 New Yorker, AM/FM/Marine Automatic (US band). 10. 911, 912 Factory accessory Brochure - October 1967. 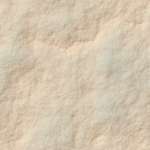 9327 Boston, AM (US band). 9323 Frankfurt, AM/FM/SW (US band). 11. 911, 911-S, 912 Factory accessory Brochure - September 1968. 12. All 911 Models Factory accessory Catalog, 1970. 13. All 911 Models Factory accessory Catalog, 1971. US Version Blaupunkt Radios have an FM band of 88-108 MHz, compared to Euro FM band of 88-100 MHz. Radio Wave "Bands" AM/FM/SW/M, etc. The following is an explanation of the various wave "bands" found on Blaupunkt radios, both US versions and European versions. 1. US Band "AM" = Euro Band "AM" or "M", Frequency 520-1640 Khz, used for Commercial. 2. US Band "FM" = Euro Band "U", Frequency 87-100 Mgz (87-108 US), used for Commercial. 3. US Band "LW" = Euro Band "L"/"LW", Frequency 150-340 Khz, Commercial/Aviation/Weather. 4. US Band "MB" = Euro Band "MB", Frequency 2-2.8 Mgz, used for Marine. 5. US Band "SW" = Euro Band "K", Frequency Various, used for Short Wave. As can be seem from the above, Blaupunkt radios came with one or more different frequency bands. The basic one-band radio came with the AM band. The next step was usually AM/FM. A common third band was LW (long wave) or SW (shortwave). In Europe, the LW band is for commercial broadcasts, however in the US, the LW band is used for aviation and weather broadcasts. European version radios are marked with the Euro band designators (M, U, L, MB or K), found on the push buttons. This is not an FM radio! Blaupunkt Radio Series by Year. You can tell when your radio was manufactured by looking at the serial number, which is printed on a paper tag attached to the side of the radio. Blaupunkt serial numbers begin with a letter, and it is this letter which tells you the actual year of manufacture. 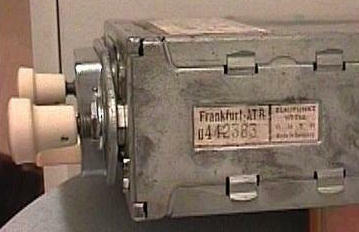 Examples of the Paper Serial # Tag on the side of the radio. Dating a Blaupunkt Radio from its Model Number. Another way of dating a Blaupunkt radios is by looking at is model number. 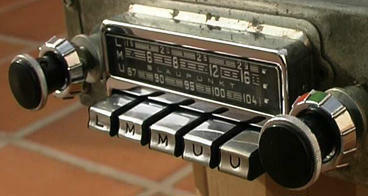 The forth number from the left in the Model Number will tell the first year that model Blaupunkt radio was manufactured. It is key to understand that the number will reveal the "first" year of manufacture, but not the actual year of manufacture. Certain model Blaupunkt Radios were made for more than one year and bear the same model number. The distinction would be determined by the letter preceding the serial number is described in the prior section. For example, a Blaupunkt Frankfurt radio with model number 7 639 670 was first manufactured in 1969 with the letter in the serial number being an "A". That same radio with the same model number was made in 1970/71 with a "B" preceding the serial number, and again in 1971/1972 with a "C" preceding the serial number. 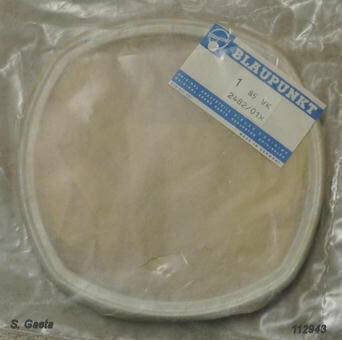 Blaupunkt Frankfurt, MN 7 639 670,"A" before the serial number, year of manufacture -1969/1970. Blaupunkt Frankfurt, MN 7 639 670, "B" before the serial number, year of manufacture -1970/1971. Blaupunkt Frankfurt, MN 7 639 670, "C" before the serial number, year of manufacture -1971/1972. Above is an ad for a Blaupunkt Koln "Selectomat" (Signal-seeker). Euro v. US Version Blaupunkt radios. There are some band frequency differences between Euro version radios and US version radios. Beginning sometime in 1957 or 1958, Blaupunkt started producing radio versions which included US specifications. These radio models were identified in the model name like Frankfurt US, or Koln US. Radio versions without the US designation in the model name are probably Euro version radios, which work fine in the US, but don't pick up the complete US frequencies on certain bands. Euro band radios can also be identified by the letters shown on the pushbuttons. 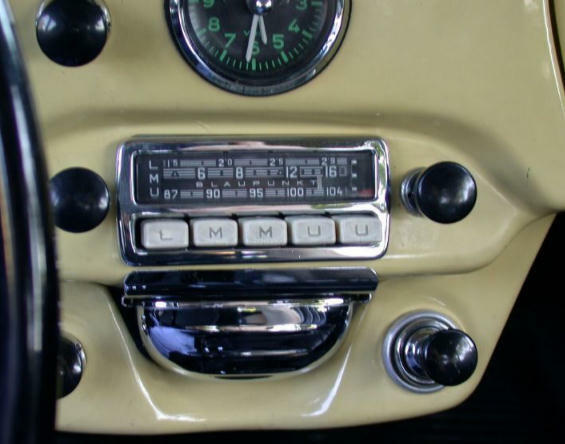 US band radios have AM, FM, SW and/or M on the push buttons. Euro radios have M, U, L, K and/or MB . (See the Euro and US radio band frequencies shown elsewhere on this website). Tube v. Tube & Transistor v. All Transistor. There has been a lot of speculation as to when radio tubes were phased out and when transistors were phased in. In the history of Blaupunkt radios during the 1950's and 60's, Blaupunkt used transistors for the first time sometime in 1958. These radios were a combination of transistors and tubes. Typically the model name included "TR" which designated that radio has having transistors, like Frankfurt TR or Stuttgart TR. Later beginning sometime in 1962, "All Transistor" models were introduced with the designation ATR. The chart showing the serial numbers by year of manufacture and model (below) shows which radios were all transistor. Many Blaupunkt auto radios are 6-volt / 12 volt convertible, and positive-ground / negative-ground convertible, meaning that with very little effort, and a minor adjustment, the radio will work on either 6 volts or 12 volts in cars with the battery grounded at either the positive or the negative terminal. To further explain, the battery of some cars is grounded at the positive (+) terminal, and some cars have their battery grounded to the negative (-) terminal. This positive/negative ground convertibility allows the radio to work in both situations. By the way, batteries in 356 Porsches are negative ground. Most of the 6v/12v convertible radios prior to about 1961 required changing or soldering jumpers inside the main case and the smaller case ("Power Pack") to change the voltage. After 1961 or thereabouts it appears that various types of plugs, as shown below, were phased in. In looking at individual radio models, appears that most "G" model Blaupunkts (1958/1959) and "D" model Blaupunkts (1960/1961) still required changing or soldering jumpers. "E" model Blaupunkts (1961/1962), except the single band (AM) Bremen, used switches or various types of plugs for 6v/12v conversion, in BOTH the main radio case and the smaller "Power Pack" After this time (1961/1962) most Blaupunkt radios were 6v/12v convertible by way of switches or plugs. Below is a page out of the Blaupunkt factory manual showing how to change/solder the jumpers in a 6v/12v convertible "D" series Blaupunkt Koln TR de Luxe radio. Blaupunkt Koln TR de Luxe US radio, "D" series, 1960/1961. Below are several methods Blaupunkt used to switch their radios back and forth between 6 volts or 12 volts, and between positive and negative ground. There are some other sneaky methods, but you get the idea! Here are some images of various other methods/switches Blaupunkt used to change voltage on their radios, 6 volt to 12 volt and vice versa! Look carefully at the back and sides of the radio for one of these conversion methods. 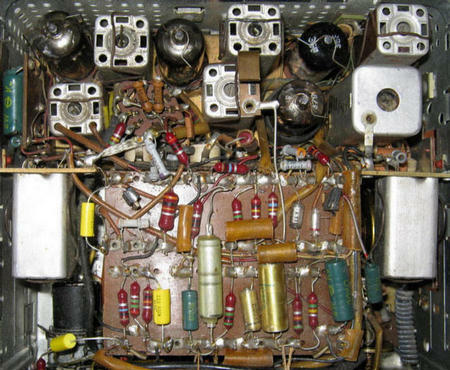 Some radios earlier than 1960 or 1961 required changing and/or soldering jumpers inside the radio case. On some models, the 6v/12v change was necessary on both cases of the radio, i.e. the main case, and the smaller "power pack". Images provided by Jim Breazeale, EASY Porsche, San Francisco, California! At www.easypor.com. Most everyone knows that the dial faces of 356 Porsche dashboard instruments have green lines and numbers. Take a close look at your Tachometer, Speedometer, or Clock! Assuming it is original to the car, it has green lines and numbers. The same goes for MOST factory accessory Blaupunkt radios! It does make sense. If the factory is going to have an accessory radio, it only makes good sense that their accessory radios would also have a green lines and numbers. instruments in Porsche cars had green backgrounds." Some say this is not an definitive answer, and they may be correct. It was the Bosch Company employee's opinion, and some, perhaps most, won't accept an opinion as fact. So there are two sides to this "controversy". One side says that ALL Blaupunkt Radios that came from the factory in 356-C's with "U" or "V" serial number prefixes have white dial faces. The other side say, well, OK, if that is so, first, how do you prove it, and secondly why did Blaupunkt and/or Porsche switch from green dial faces to white faces? 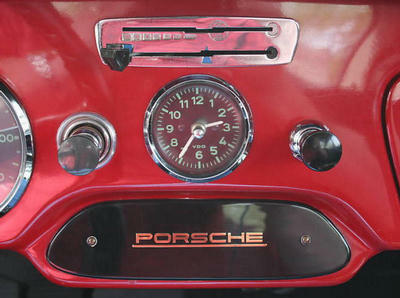 Even when the other gauges on the 356 dashs still had green dial faces? Anybody got a "U" or "V" Blaupunkt Radio with a Green Dial Face? Factory Workshop Manual of your choice (Pre-A, 356-A, or 356-B/C). Above is a Euro AM/FM/Long Wave Blaupunkt! The First Transistorized Blaupunkt Autoradio. While the transistor was invented in the United States, Sony Corporation of Japan produced the first mass produced, pocket sized transistorized radio in March of 1957. It didn't take long for the transistor to revolutionize the production of auto radios. 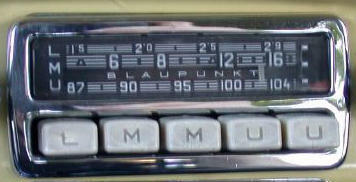 Blaupunkt started producing auto radios with transistors in late 1957 or early 1958. These early radios were part tube and part transistor, with the transistors mounted on the outside of the back of the radio case. By sometime in 1961, Blaupunkt was producing all transistor (no-tube) radios, designated by "ATR" after the radio name, as in Frankfurt de Luxe ATR. These all-transistor Blaupunkts were first made available with the 356 B T-6 Porsches. Radio Descriptions by Year and Model with Serial Numbers. Below is an incomplete listing of the Blaupunkt radios, by model, that were factory accessories for 356 Porsches. Under the year is a letter which is at the beginning of the radio serial number. 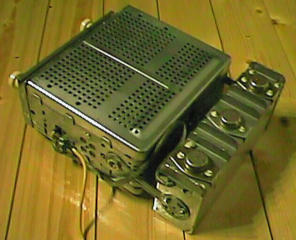 Additional information includes: number of pushbuttons, one or two piece radio case, Euro and US versions, starting serial number of the series, frequency bands included, whether or not the radio is 6v/12 convertible, and whether or not the radio is tube, part transistor (TR), or all-transistor (ATR). If you happen to have any of the missing information, please contact me so that it can be included in this chart. *The above models were all the auto radio models produced during this period. The above information was condensed from many sources. There is no way to determine the completeness of this information. There are probably other serial number series for the various categories shown above. The only radio models included above were those offered as factory accessories for 356 Porsches, as described in the factory Accessory Catalogs. There are numerous other Blaupunkt radio models that are not included, such as the New Yorker, Capri, Hamburg, Kassel, Munchen, Export-Super, Hannover, Manhattan, Toronto, and Viena to name a few. As additional information is found, it will be added to the above chart. If you have any information not included above, we'd love to hear from you. See contact information below. Correct knobs of Blaupunkt Radios in 356 Porsches. Most people agree that the correct knobs for Blaupunkt radios in 356 Porsches are the "Tulip" knobs, show below. Radios ordered as factory accessories came with Tulip knobs. The reason for this is that the Tulip knobs on the radios should match the Tulip knobs on the rest of the dashboard. As with everything 356, there are always exceptions. However, it doesn't make a great deal of sense to have mismatched knobs on your dashboard. Some don't care, and that's just fine! What's wrong here......white lettering on radio, green lettering on clock and everything else! Doesn't it make sense that both should be green? Why, as it has been alleged, were the dial faces on all 356-C's white? Also, white radio pushbuttons and black dashboard knobs! Shouldn't they match! Two, Three & Five Pushbuttons Blaupunkts. 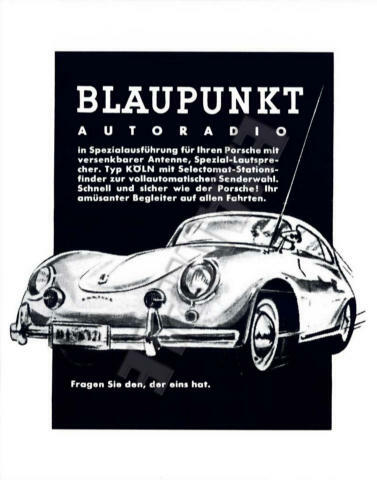 During the period 1956 to 1965, Blaupunkt radios selected as optional equipment for 356 Porsches had 2, 3 or 5 pushbuttons, depending on the model of the radio and the number of bands (AM, AM, SW, etc). For identification purposes, the chart showing the serial numbers by year of manufacture and model show which radios had 2, 3 or 5 pushbuttons. Not all the radio knobs depicted above are 356 Porsche styled knobs. Two piece case v. One piece case. Blaupunkt radios going back to the early 1950's had two piece cases. In the early radios, the second case, sometimes known as the "powerpack" (an incorrect technical reference), was a big as the main radio. In very early 356 Porsches, this second case was mounted under the floorboards. As radios miniaturized over this period, the second case got smaller, and was hung behind and slightly below the main case of the radio. Some of the Blaupunkt models during this transition period had up to 3 quarter sized transistors mounted on the outside of the second case (see the picture above). US v. Euro Radio Tube Conversion Chart. One of the problems in repairing older Euro version tube radios radios is the difficulty associated with getting replacement tubes. The conversion chart below shows US radio tubes that are interchangable with common Euro tubes found in Euro Blaupunkt radios. 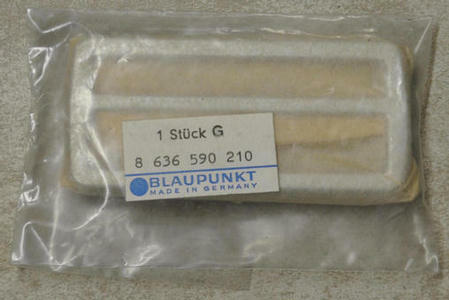 Blaupunkt Face plates for 356 and some early 911 & 912 Porsches. Blaupunkt supplied radios to many European car manufacturers, including Mercedes Benz, Volvo, Volkswagen, and Jaguar to name a few. Each dashboard design was different, and so were the various face places designed for each model. The face plate normally intended for 356 Porsches, at least from about 1956 on, was a chrome square approximately 4 inches by 2 inches that fitted to the face of the radio. The radio without the face place was installed from up underneath the dash with the knob masts and dial face sticking through the dashboard. Once fixed in place with mounting nuts, the chrome face plate was snapped in place on the front of the radio. There are several versions of this chrome faceplate. Some say Blaupunkt on the center bar. There are a few versions that snap onto the radio first, and then the radio is installed in the dash. Non-standard, but attractive full faceplate! Porsche Factory Radio Delete Plate. 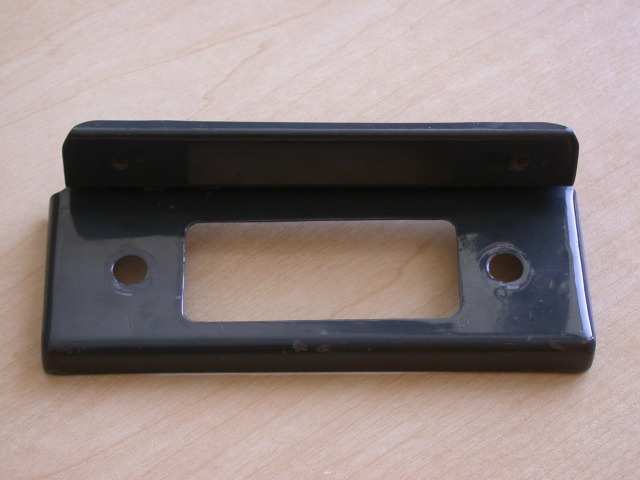 Factory Radio Delete Plate in a 356-B T-6. 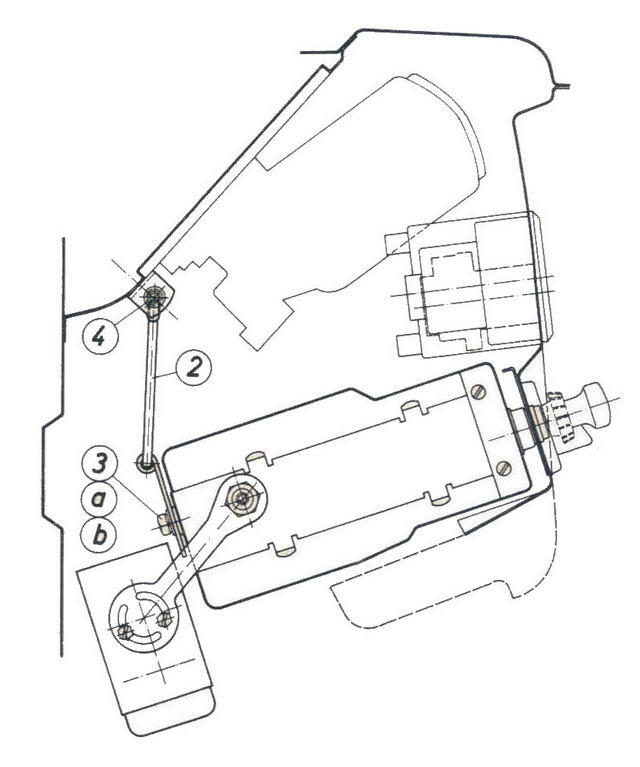 Installation Instructions for Blaupunkt Radios. The following precautions were found in the factory manuals pertaining to installing Blaupunkt auto radios. 1. Before installation, check voltage and polarity for 6v/12v and +/- convertible radios. 2. Disconnect grounded battery terminal. 3. Remove dummy plate from receiver cutout on dash. 4. Insert receiver in dashboard from the rear, and attach with hanger and nuts provided. 5. Connect battery cable from radio ( yellow wire ) to terminal 54 of ignition lock. 6. Slide protection sleeve over fuse cartridge. 7. Prepare speaker openings in the RH and LH sidewall. 8. Insert speakers with mounting rings. 9. Connect speaker connecting cables to speaker leads. 10. NEVER TURN RADIO ON WITHOUT ONE SPEAKER CONNECTED! 11. Plug connection cable plugs into diagonal speaker connection sockets of receiver. 12. Remove left door wing. 13. Mark antenna hole through upper door hinge. 15. 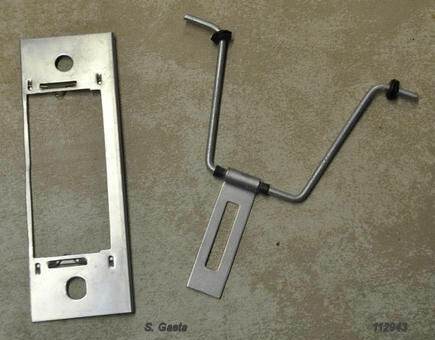 Introduce antenna from below through the upper door hinge and secrue with cap nut. 16. Plug male antenna plug into female antenna receptical on side of radio. 17. Turn on radio and see if it works........! BE SURE THE SPEAKERS ARE HOOKED UP! 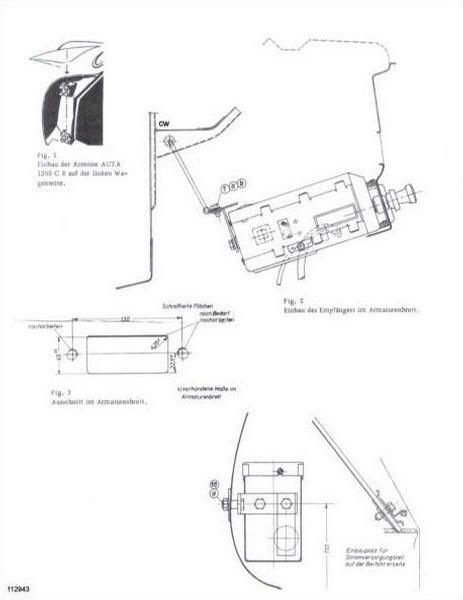 Blaupunkt Radio & Speaker Exploded-View Diagrams. Dotted line with circles on both sides represents dashboard. Chrome face plate mounts onto the radio after it has been installed from behind the dash. Metal hanger with strap attaches up under the dashboard. The nuts and knobs are installed last. The order of assembly of the speakers. The image to the far right is the carpeted area forward of the doors and above the floor. An Actual Blaupunkt Factory 356 B/C Installation Kit. A NOS Blaupunkt radio installation kit for a 356 B/C Porsche! Image by Sebastian Gaeta! Chrome Face Plate on outside of dash. Interior Speaker Frame and Speaker Wiring. 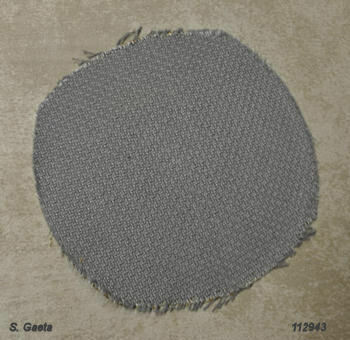 Metal Mesh behind Speaker Cloth. Face Plate behind dash and Radio Hanger. Blaupunkt Radio Exploded-View for a 356-A Porsche! Blaupunkt Radio mounting diagrams for a 356-A Porsche! 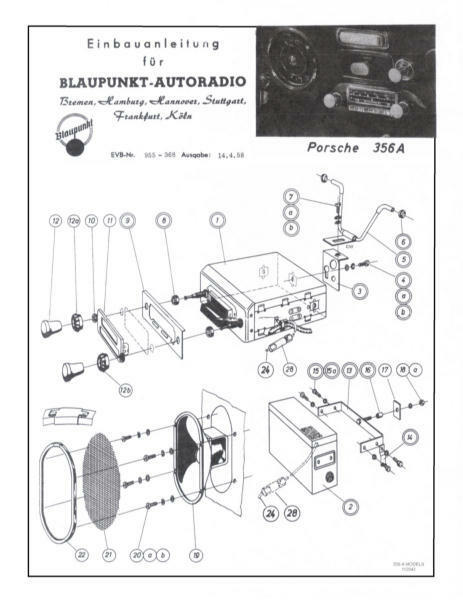 The Blaupunkt radio mounting instructions for a 356-A Porsche show the second case of the radio, sometimes known as the "Power Pack", should be mounted under the passenger side kick board. 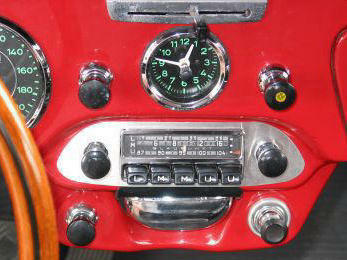 The main case of the radio is mounted, from the underneath of the dash, in the cut out already provided in the dash, and is suspended by a hanger attached to the back of the main radio case. 356 Porsche Roadsters, which were produced for model years 1960 thru 1962, did not come with cutouts in the dash for a radio! 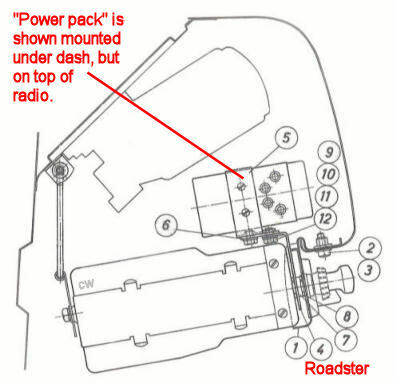 Because of this Blaupunkt offered a special mounting kit that mounted the radio under the dash utilizing the same radio hanger used in Coupes and Cabriolets, but with the second piece of the radio, sometimes incorrectly called the "power pack", mounted on top of the main case rather than below and behind (see the diagram and parts list below). 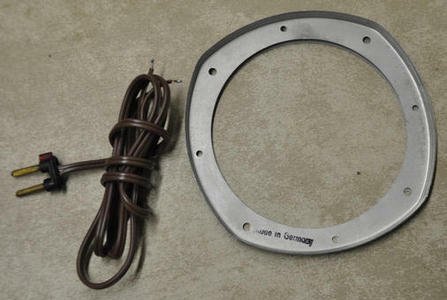 The Blaupunkt mounting bracket shown below for 356 Porsche Roadsters is shown in the Porsche Factory Accessory Catalog dated March 1961 as accessory #9614, Radio Bracket for Roadsters! 356 Porsche Roadster Blaupunkt Radio Mounting Instructions, Blaupunkt AUTORADIO Bulletin 111-61! 356 Roadster Blaupunt Radio Bracket used by factory. Image by Jon Bunin! smaller case,which hangs behind and slightly below the main case of the radio. Above the radio in the line drawings is the clock, and below is the ashtray. Blaupunkt Radio Speaker Diagram, and Speaker Wires Plug-in! So What About the Wires? A lot of the questions I see asked about installing a Blaupunkt radio are about the wires. What wires go to what? Actually, this is a fairly easy to answer, and hopefully this explanation and the pictures below will help. There are several kinds of wires that come out of a Blaupunkt radio. The first is the hot wire by which the radio gets power. On Blaupunkt radios, this hot wire is usually yellow. Most often, this wire contains an in-line fuse, and is connected to a lead on the ignition switch that becomes hot when the key is turned on. If you get this wire hooked up, and there's no power, turn the key to the "on" position, and then check to see if there is a fuse in the inline fuse holder or if the fuse is bad. 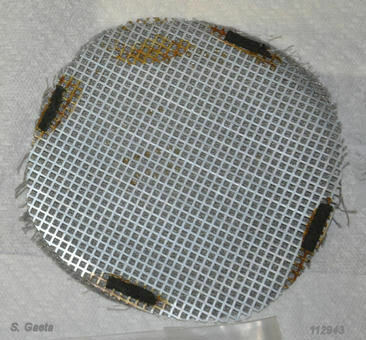 On two piece case radios, there is a thick wire mesh bundle of wires with a multi-prong plug on the end coming from the main case of the radio to the so-called "power-pack". On later Blaupunkt radios, there is a short usually light gray wire that comes out of the body of the radio that has a female plug on the end. This is the antenna wire. Plug the "male" end of the wire from your antenna into this female plug. And lastly, there are the wires that come from the speakers. For most Blaupunkt radios of this era, there are no speaker wires coming from the radio case. There are female plugs on the side of the case of the radio into which are plugged the wires from the speakers. DON'T TURN ON THE POWER TO A BLAUPUNKT RADIO WITHOUT THE SPEAKERS PLUGGED IN! In the picture above, the yellow wire is the power wire. 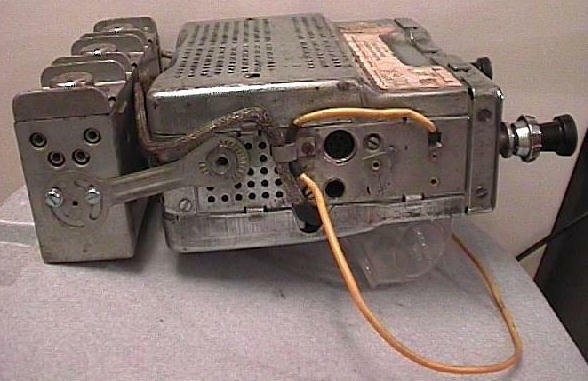 The thick steel-braded wire connects the main case of the radio to the "power-pack" on the back. The four holes on the power-pack are for the speakers. Use the two bottom holes for one plug, one speaker, and the two to the left and the two to the right for two plugs to connect two speakers if the radio is stereo. It should be noted that different models have different setups, but the above will give you the general idea. Beginning in the early 1950's, Blaupunkt offered a separate short wave adaptor to be used in conjunction with their line of auto radios. The short wave adaptor was a separate unit, usually mounted under the radio in a 356 Porsche, which provided additional short wave capability to a radio already equipped with a short wave band, or added the capacity to a radio without short wave capacity. The typical unit had nine additional push buttons as shown below. Short wave adaptors like those shown here were not offered as factory accessories for 356 Porsches. Example above is a VK900. Prior models look very similar. Odds and Ends of Information. 1. The In-line Fuse in the Hot Wire is 8 Amps for 6-volt systems, and 4 Amps for 12-volt systems. 2. The Dial Face Lamp is 7V / .1 A Osram 3370 for 6-volt systems, and 14V / .1A Osram 3371 for 12-volt systems. 3. On certain Blaupunkt Koln "signal-seeker" automatic radios, there is a knob behind the outside knob that has red, blue and green color markings on it. Many do not know what these colors are for. This knob is a signal sensitivity switch. There may be I, II or III markings where the color shows. The "I" marking is for tuning only the strongest local stations, same but to a lesser extent for the "II" marking, and the "III" marking is for tuning very distant stations. This regulates where the automatic signal seeker stops when using the radio on the automatic setting. See photo below. Most Blaupunkt Kolns have chrome pushbuttons. 4. If you have a Noticable Blue Dot on the dial face of your radio, it's NOT a 356 Era Radio! 5. If you have Four (4) Bands, like AM/FM/SW/LW on your radio, it's NOT a 356 Era Radio! 6. To Remove Push Buttons, look under the Push Button, & use a screwdriver. You'll figure it out! 7. To Set Push Buttons, find the station you want, pull Bush Button all the way out, then push in! 8. 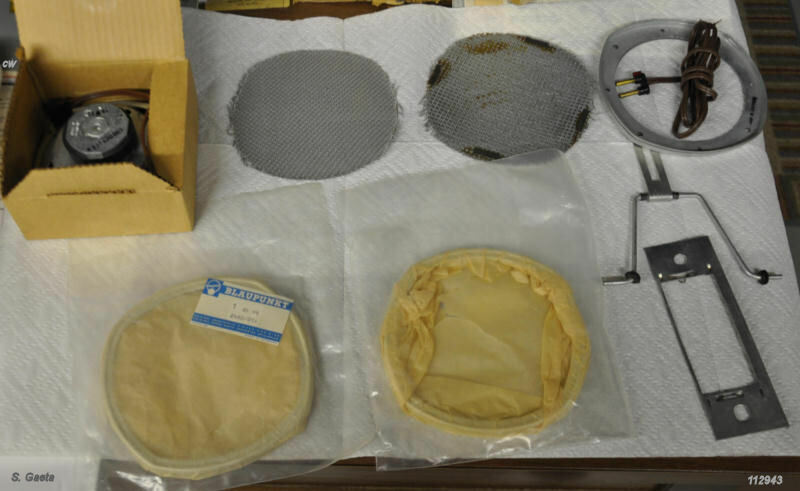 To Change Dial Face Lamp, remove chrome face plate, remove dial face, remove reflector, and push isolation sleeve (1/4") on dial lamp and pull out dial lamp with light pressure turning to the left. Blaupunkt Radios for 1965 911 Porsches. 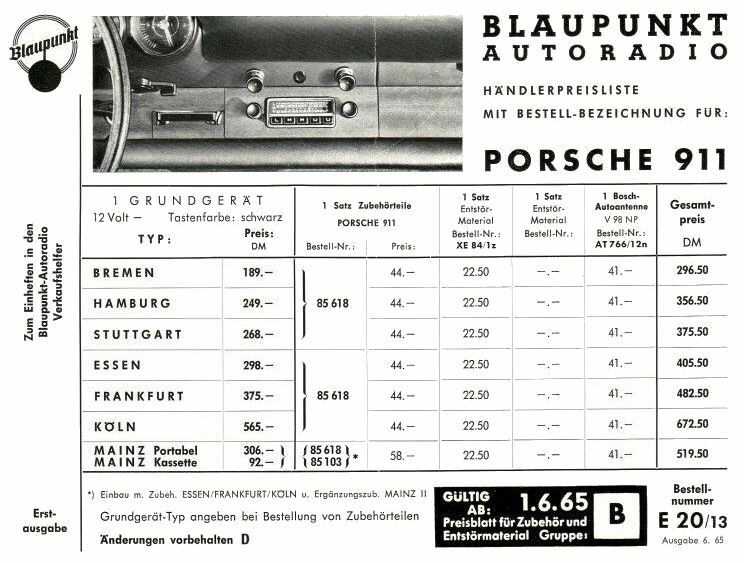 Blaupunkt listing of radios available for 911 Porsches, dated June 1965. Blaupunkt Service & Instruction Manuals. time during the 356 Porsche era. Radio Service Locations dated 10.61. 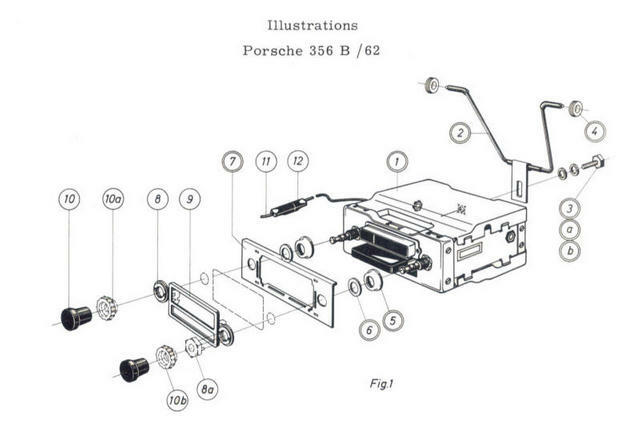 Installation instructions, Porsche 356-B 1962. Installation instructions, Porsche 356 B & C.
Blaupunkt "T" Series Alignment Instructions. Blaupunkt "U" Series Printed Circuit Boards. As mentioned serveral times above, any additional information you may have about Blaupunkt radios from the 1950's and 1960's would be a welcome addition to this website. Again, the purpose is to accumulate and present as much information as possible for anyone to use. 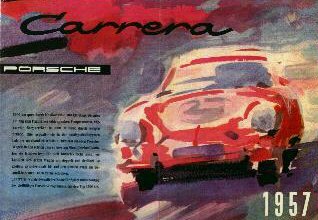 Sales Literature, and lots of other 356, 911 & 912 stuff! This website was prepared for educational, historical, and informational purposes. of the pictures and want them removed, they will be removed.